"We were looking for ways to invite young kids into the saga through exciting and vibrant bursts of animation that didn’t talk down to them. 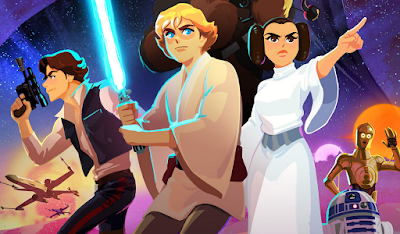 Hopefully the shorts will leave young viewers newer to Star Wars wanting to discover more about the saga — from Luke Skywalker and his journey to becoming a Jedi, to Darth Vader and his power of the dark side, to Leia and her path from princess to rebel leader. They’re fun, stylish stories that thrust the viewer into the big events of Star Wars, while also exploring its greater themes." Rimes also shared the thought process behind each episode, which you can read over at StarWars.com. More Galaxy of Adventure shorts will be debuting next month, as well as throughout the new year. In addition, toys based on the series are now available at Wal Mart.